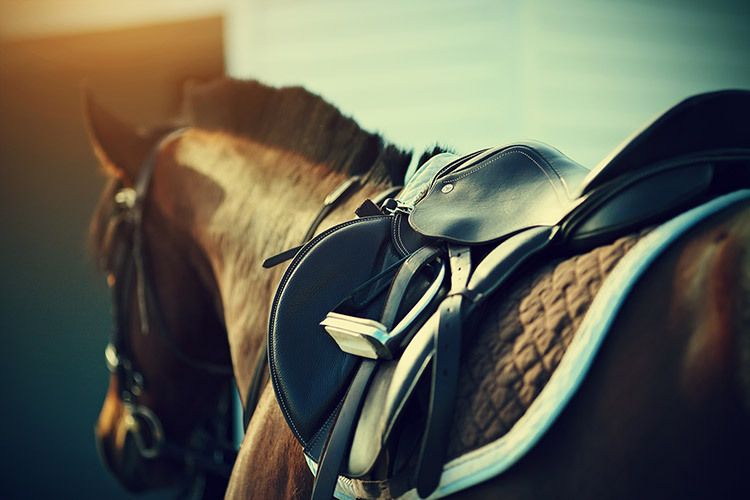 The single most important piece of tack for any form of horse riding is the bridal. The bridal is the tool that is used to control a horse and is what signals instructions to the horse via the reigns, bit and the connected chain that runs underneath the jaw. Reigns are typically used to push the horse in the direction they need to go, which is called neck reigning. In the event that a horse isn’t cooperating you need to use the other reigning technique known as plow reigning, which involves grabbing hold of the reign as high up and as close to the horse mouth as possible and pulling, which forces their head to turn in the direction they should be moving in. Reigns also provide the stop command by gently pulling back on the reigns. The pulling motion causes the chain under their jaw to tighten and squeeze which is their queue to stop what they’re doing. There are specifications that need to be followed when handling the reigns. The first is how much slack is given to the reigns, because too much or too little can cause problems. Too much slack can make it impossible for a horse to feel or understand what’s being asked of them. This is dangerous because that means you have no control over the horse and they are left to their own devices. On the other hand, if you hold the reigns too tightly the horse can become confused and misinterpret it as the signal to stop. If you hold tense reigns long enough the horse can develop what’s called a “hard mouth” where the horse no longer responds to stop commands, damaging the integrity of their training and causing them to become dangerous to ride. Not to mention that tight reigns actually are painful to the horse because of the consistent pinching of an area where the skin is already thin and delicate. There are other various forms of giving commands to a horse, but not all are equal, but most of all it’s important to remember that the single most important thing to have is patience for both you and the horse. With enough time and experience you’ll develop the skills to work with horses no matter what style you prefer.